Good tea sourced from around the world. Comins Tea House imports ethically grown fair trade teas from around the world, direct from hand-selected producers, as well as working with British designers and craft makers to create beautiful hand-made tea-ware. Rob and Michelle Comins were inspired to share their love of fine tea after visiting the Makaibari Tea Estate in the hills of Kurseong, India. Since then they have opened their own tea shop in the picturesque Dorset town Sturminster Newton, and a second tea house in the beautiful city of Bath. When Comins Tea House first made contact they had already started developing their logo, with its eye-catching "Comins Cat" and charming illustrations. We supported them to develop their ideas into a fully formed brand and an e-commerce web solution. 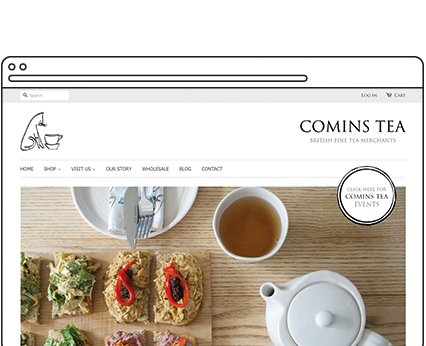 We built a powerful and advanced e-commerce platform for Comins Tea, providing a rich set of features. It allows for variable products (such as multiple weights or colours), bespoke features, integrated blogs and newsletter integration. The site is fully responsive for mobile, tablet and desktop devices; allowing Comins customers to shop from anywhere. The result has a direct and elegant feel, which reflects the ethos of how Comins Tea House source its teas. Comins e-commerce website allows for secure online payments. Because it utilises a very secure 3rd party payment gateway, Comins don't have to lose any sleep over the security of customer's details. The website is automatically kept up to date with the latest security updates. Customers can opt to create an account, or complete their checkout as a guest, and can use either credit cards or Paypal to make payments. The website also integrates with Mailchimp, allowing customers to sign up to Comins email newsletter with a single click. An important goal for the website was to make it extremely simple for Comins to control the content themselves. It needed to be easy for them to add new products, create blogs and edit content. The new website has simple 'WYSIWYG' editors, intuitive admin dashboards and bespoke settings panels, allowing Comins to take full control of their website content. The user interface is user friendly, and makes content editing incredibly simple. "We feel extremely lucky to have found Wired Canvas. They have supported us every step of the way, bringing our ideas to life and creating a truly exceptional site, beyond our high expectations. They are very easy to work with, and made the whole process as enjoyable as possible. We were a new business, so we very much appreciated their patience in working through our numerous questions and ideas. Another key quality was that they cared enough about our business to challenge us when they thought necessary. We are also extremely grateful that they spent time training us to take ownership over certain elements of our site, something that is essential for a small business like ours. It has been a pleasure (for us anyway) and we look forward to continuing to develop and grow our website with their help."